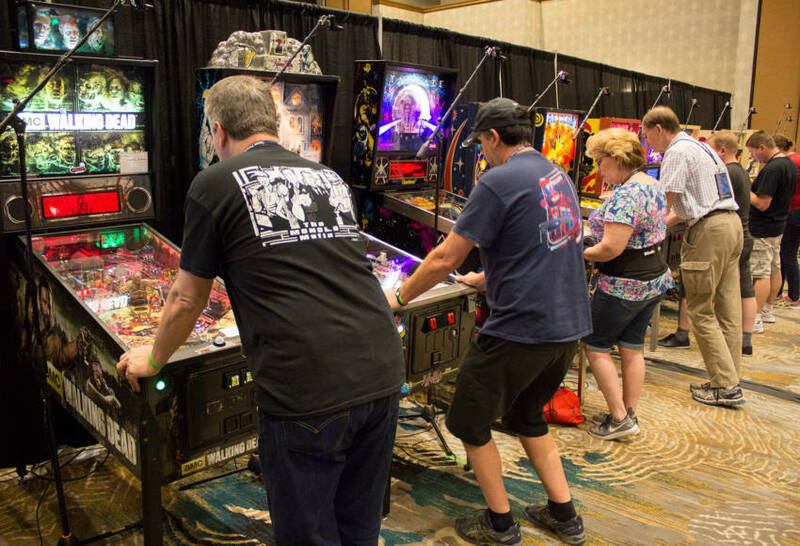 The 2019 Texas Pinball Festival will be held the weekend of March 22 – 24, 2019 in a HUGE 40,000 square foot game room! We’ll be at the Embassy Suites Dallas – Frisco Hotel and Conference Center in Frisco again, and we want to top what we did last year and fill this space with more than 400 pinball machines, classic video games and other game room goodies set up on free play for everyone to enjoy the entire weekend. Leave your quarters at home! Children under 5 get in free. Pre-register for the 2019 Texas Pinball Festival starting October 1st, or find out how get in FREE when you bring a game! T-shirts, tournament tickets, and other merchandise will be available for pre-order and sale at the show and of course at the door. And don’t forget to book your room. Check out all the details here. Vendors, collectors and hobbyists from the surrounding area and beyond will be bringing parts, supplies, game room memorabilia, pinballs, video games and more for sale. People just like YOU will be bringing their own machines to share. Lucky winners will take home door prizes and someone will take home a new pinball machine from our annual American Heroes raffle. The Texas Pinball Festival opens it’s door Friday evening at 5pm and will stay open until 1am on Friday and until midnight on Saturday. The hotel offers multiple options for food and drink. And don’t worry about trying to find a way home. We’ve contracted at several hotels for a block of rooms available at a special rate just for our guests. Be sure to book your room(s) early as they go super fast. Find out more about the Embassy Suites here. Do you have what it takes to be a pinball wizard? A variety of adult and children’s tournaments will be held throughout the weekend to test your skills. Compete against others for trophies, ribbons and cash prizes. You could walk out a superstar! As if inside wasn’t fun enough… Check out the bargains outside! Saturday, March 23, 2019 starting at 8:00am, the DFW Pinball and Arcade Club will be putting on an outdoor flea market and swap meet featuring coin operated collectibles, project machines and more! Admission is free to all guests. Got a machine taking up space in your garage? Too many projects? Too many parts? Bring ’em to the swap meet! Interested in participating in the swap meet? Find out more here. The show will conclude Sunday afternoon after the Awards Ceremony scheduled for 2:30pm. Though we give out door prizes all weekend long, one lucky winner will take home the Raffle Drawing grand prize: a brand new pinball machine! This show draws people from all over the United States and beyond. It is one of the largest shows in the industry and we want you to experience it first hand. So come on out and join us!